This is a great place to live. So many perks and neighborhood is full of great people. Staff is nice and usually helpful. Roommates are great. So far so good! I am excited to move in to knights circle in the fall!! I have been getting a lot of emails updating me on things to keep me in the loop. I love it here. The location is great, I'm living with the people I wanted to, and there's a lot to do here. Definitely a great place to live. We appreciate all the stars! so excited to live here! i signed a lease for next year and i can already tell i’m going to love it! can’t wait to use the gym and have a balcony to read on! You're going to love it! Look for your assignment email in early-mid July and if you did roommate matching at all, make sure to reach out to your roommates right away to make plans on what everyone is bringing! If you need anything in the meantime, don't hesitate to let us know! The room and layout are pretty nice and overall very convenient as a UCF student. It's clear this is student housing which has pros and cons. The monthly events are really nice, but very crowded. We really appreciate you taking the time to provide us your feedback! If there's anything we can do to improve your experience don't hesitate to let us know! The community has great amenities, the staff and service is great, and the location is great. 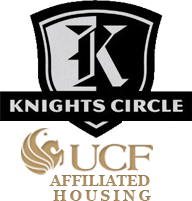 Knights Circle has been the best first out of home living experience for me. Love Knights Circle! Great amenities and layout. Super friendly staff. I love when staff gives out free food. Prices are getting a bit high though. Great community especially if you are going to UCF or if you have Florida pre-paid. The activities & movie room is a plus! The also provide great customer service! I have lived in many apartment complexes and Knights Circle has no doubt been the best. The community is so welcoming and warm-hearted. It is hard to explain in words, but when you are here you just feel a certain way. The staff is always quick to answer your questions and problem solve any issue at hand. The community areas are always well kept and truly enjoyable. Maintenance is so quick and efficient with their work which helps ease my worries about something going wrong. Ultimately, Knights Circle is an awesome place to live, thank you for everything! Thanks so much! We really appreciate you taking the time to let us know you're enjoying KC! If you ever need anything we're here for you! 407-563-0980! Me and my friends love watching movies in our living room. The place is the best and much better than towers. My balcony view is the best we always sit and listen to music. We are so proud of Knights Circle and thrilled that you love living here! Thank you for the GREAT review! If you need anything, please feel free to contact us! What can i say i lived, i learned, i laughed, i stayed up all knight studying and doing hw, and it was all at my home at knights circle woo. What a wonderful place. Loved how close it was to campus and the amenities such as the pool and gym! Maintenance is great and there are always shuttles. Overall very convenient !! I haven’t lived in knights circle yet but I really liked it when it when I would visit my friends there. The pool, the space, and different amenities offered are great. You're going to love it! Make sure to reach out to your roommates when you get your assignment in July! That's the best way to have a great move-in experience! The individuals in and around Knight Circle are great. The cost, staff, and bug issues- not so much. I'm just grateful to have a place close to campus with a good shuttle system. Thanks for the feedback! If there's anything we can help with please don't hesitate to let us know! You can email our GM at Robert.Myers@assetliving.com for direct assistance! Amenities are pretty nice, some of the appliances are rather old but they still work well. The transportation to UCF is really nice, so I don't have to pay for a parking pass and worry about fighting for parking on campus. Thanks for the kind words! We're replacing a ton of appliances in 2019, so keep an out for notices about that! I have enjoyed living in Knights Circle. I'm glad the gyms are 24/7 now and the shuttles have become more reliable. I utilize the study room often and enjoy the variety of seating made available. Knight Circle has a lot of great amenities to use and I love all of the events that goes on every week. It’s great to be able to get free food and prizes from your community. I love it here! The rooms are much roomier than my previous place, and there are plenty of amenities. If I need something that is normally a part of anyones home then knights circle almost always has it. The one thing I wish they had was a hot tub. Thank you so much for your kind words. Resident satisfaction is very important to us so your review made our day!!! Knights Circle has been a great place to live these past few years. The community has lots of amenities, plenty of shuttles, and is overall a friendly neighborhood. There are some negatives, such as rent becoming more expensive, appliances breaking down more frequently, walls being thin, and maintenance sometimes coming into my room without notice or permission given. I will be graduating and moving away soon, so I'll put up with the negatives in the meantime. Thanks for the feedback, Carly! We appreciate you taking the time. We've got a massive expansion of new appliances coming in Fall of 2019, though sadly that will miss you. We think you're going to love it! If you're getting any random roommates for Fall make sure to contact them as soon as you get your assignment! That's our number one tip for having a great move-in experience! It is very clean and well maintained. I have not moved in yet but through the tour the staff seem very nice and attentive and the community is very nice and protected. We think you're going to love it! If you get roommate matched, make sure to reach out and contact them ASAP when you get your assignment in July. This is our number one tip for a great move-in experience!